• The PerfectPleat Ultra will give you the performance our competitors promise but can't deliver. Compare to 3M Filtrete, Farr, Purolater, AirGuard, Koch, and Precisionair. • Providing Greater Than 70% Efficiency on 3-10 Micron Particles! Rated MERV 8. Lasts 90 days. 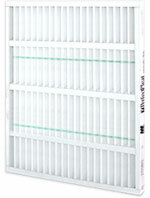 • The Industry's Premier Extended Surface Pleated Panel Air Filter. The higher efficiency of the PerfectPleat Ultra means improved Indoor Air Quality (IAQ) in your facility. In addition, when you use it as a prefilter, you not only improve the air, you dramatically extend the service life of higher efficiency final filters. Use it as a primary filter in place of other less efficient pleated panel filters, and you will significantly reduce the accumulation of dirt in your air conditioning system. In any configuration, the PerfectPleat Ultra improves protection of the critical, and expensive, components in your air conditioning system. The PerfectPleat Ultra maintains its high efficiency throughout the life of the filter and becomes much more efficient after the first dust loading. It is not enhanced by an electrostatic charge that dissipates over time reducing filter efficiency, in some instances significantly. This is a magnified view (400x) of competitive "clean cotton/polyester filter media". Note the fungal growth (Aspergillus fumigatus) radiating from the filter media fibers. Untreated high efficiency media with fungal growth (Aspergillus flavus) appearing on the air leaving side. All PerfectPleat Ultra filters incorporates Intersept © antimicrobial which is engineered specifically to improve IAQ. All filters are incubators of microorganisms. Intersept © acts as preservative to ensure the integrity of the media throughout the useful life of the filter. EPA registered and environmentally safe, Intersept © inhibits the growth of microorganisms (mildew, bacteria, fungi) documented to affect IAQ. This is important because the higher efficiency of the PerfectPleat Ultra means the filter removes significantly more microorganisms from the air. AAF © introduces the new all white PerfectPleat Ultra media. 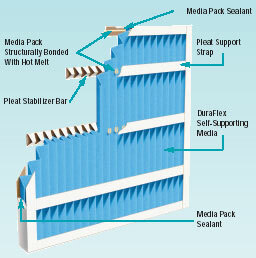 The 4" depth series places a DuraFlex media pack inside of a two piece frame. Straps are added to the air entering side of the filter to help maintain pleat spacing, while specially designed pleat spacers are inserted onto multiple rows on the air leaving side. The pleat spacers also assist in keeping the pleats open during use, maximizing filter life. The two piece frame is then assembled around the rigid media pack and is bonded at all contact points with adhesives that ensure resistance to moisture. The result is unlike anything available in a 4" pleat coupled with strength and durability. All frame components, straps and pleat spacers are made with 28 pt. beverage containerboard with the highest wet-strength available. A perimeter frame of 28 pt. beverage board is securely glued to the media pack to create a solid cellside. The 28 pt. clay-coated board improves filter strength and helps resist damage. Newly designed pleat stabilizers, bonded to the media to ensure pleat spacing uniformity, provide additional strength. Three sets of pleat stabilizers are positioned on the air-leaving side of the filter. On the air-entering side, three support straps add to the PerfectPleat's strength. The support straps and pleat stabilizers ensure integrity against turbulent airflow and provide excellent lateral stability for installation in side-access systems. The PerfectPleat is ideal for any application where pleated filters are currently in use and higher efficiency is required or desired. It offers superior durability and performance in the most demanding applications. The 1" PerfectPleat Ultra has the same durability and performance as the 2" depth model. Both are made using DuraFlex media encased in a unique beverage board frame. PerfectPleat Ultra 1" features 3 support straps on the air entering side and a patented die cut pattern on the air leaving side. Perfectly shaped and spaced pleats. Uniform size virgin fibers are assembled in closely controlled blends to create a media that is both self-supporting and remarkably consistent in performance. The self-supporting characteristics allow a pleating pattern that promotes excellent dust holding and resistance characteristics. The PerfectPleat meets or exceeds all current expectations for service life and required airflow and has a guaranteed Minimum Efficiency Reporting Value (MERV) of 8. DuraFlex media's unique construction makes it self-supporting. When pleated, DuraFlex will hold its shape without the need for wire support characteristic of conventional pleated filters. That means no potential for the formation of rust and safer handling no nicks or cuts for the installer. With the superior resiliency of DuraFlex media and no need for wire support, the PerfectPleat can sustain significant abuse and maintain its shape and pleat spacing. The absence of the wire also makes the filter totally incinerable, which simplifies disposal. Under ASHRAE standard 52.2, PerfectPleat Ultra filters are classified with a Minimum Efficiency Reporting Value of MERV 8, providing greater than 70% efficiency on 3um particles. Insist upon documented performance. With the AAF PerfectPleat Ultra , MERV 8 classification is documented with test results from an independent laboratory. The PerfectPleat Ultra will give you the performance our competitors promise but can't deliver. In general, all standard filter sizes are stated according to their nominal size and not their actual size. This information can be found on the side of your filter. For example, our standard PerfectPleat Ultra (nominal) 20x20x1 measures (actual) 19-1/2 x 19-1/2 x 3/4. The nominal size represents the size of your filter rack. The actual size represents the size your filter needs to be to fit inside your filter rack. If your filter rack is an odd size, a standard sized filter may not fit properly. In this case, you would need to order a custom made filter. Minimum filter size: 4" x 4" and a Maximum filter size: 24.5" x 35". We can build filters larger then 24.5" x 35" but they are considered a double size (please call us for pricing at 1-888-844-5820). If a double sized filter is required, you may consider putting two filters together to achieve the size desired, i.e. 18" x 40" you would need two 18" x 20" air filters. PerfectPleat Ultra filters are classified U.L. Class 2. Testing was performed according to U.L. Standard 900 and CAN4-S111. Packaging: PerfectPleat Ultra filters are packed in a heavy duty corrugated fiberboard box. Product Graphics: A label is applied to each filter showing the product name, size, U.L. classification and air flow direction.